Throughout his career Degas stressed the importance of careful composition and strong drawing. He was one of the organizers of the first impressionist exhibition in 1874, and remained influential in the group, but his own work was deliberate and controlled, painted in the studio from sketches, notes, and memory. The impressionists like Monet and Renoir, on the other hand, sought an immediate transcription of the fleeting effects of light and atmosphere. What he shared with the impressionists was an interest in modern life—in Paris' dance halls and cabarets, its racetracks, its opera and ballet stages. "You need natural life," he told his landscape colleagues, “I, artificial life.” In racehorses and ballet dancers he found the kind of movement that fascinated him most: not free and spontaneous, but precise and disciplined. He also studied the simple, everyday motions of working women: milliners, dressmakers, and laundresses. Perhaps the language of cinema best describes Degas' work—pans and frames, long shots and closeups, tilts and shifts in focus. Figures are cut off and positioned off center. Sightlines are high and oblique. Degas' interest in photography is revealed in these elements of style, and the flat space, patterned surfaces, and unusual angles of Japanese prints, which enjoyed huge popularity in Paris in the late 1800s, also influenced the artist. Degas' family was relatively affluent, so he did not have to rely entirely on sales of his work for financial support. He was thus free to experiment and choose his own subjects; almost all of his portraits depict relatives or friends. He was also able to delay finishing paintings, reworking them until they met his exacting standards. Many times Degas retrieved works he had already delivered so that he could perfect them. Some he never completed. 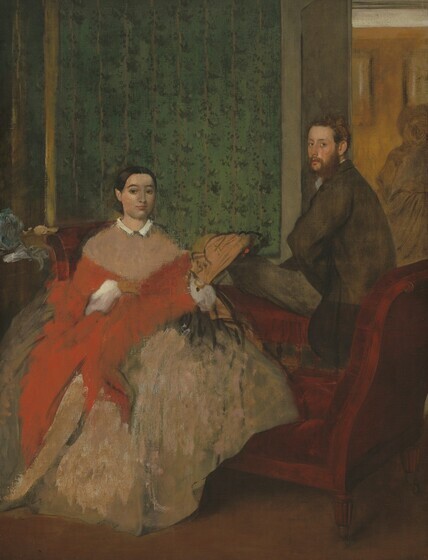 This unfinished portrait of Degas' sister and her Neapolitan husband is one such example. (The painting was in his studio at the time of his death.) Notice how Thérèse's dress and shawl are undefined masses of color. There, Degas has scraped and rubbed the paint off the canvas. The dark lines indicate changes he intended but never made. The faces, by contrast, are carefully finished, detailed and expressive. Degas hoped to capture his sitters, he said, in "familiar and typical attitudes." This portrait of one of the artist's sisters-in-law was painted while Degas was in the United States. His mother had been born in Louisiana, and his younger brothers joined relatives in the family's cotton trade in New Orleans. During a visit there Degas executed this portrait of his brother René's American born wife Estelle. She was a woman haunted by misfortune. Four of her six children died. Her first husband had been killed during the Civil War, and she was later abandoned by René. When Degas painted her she was completely blind. 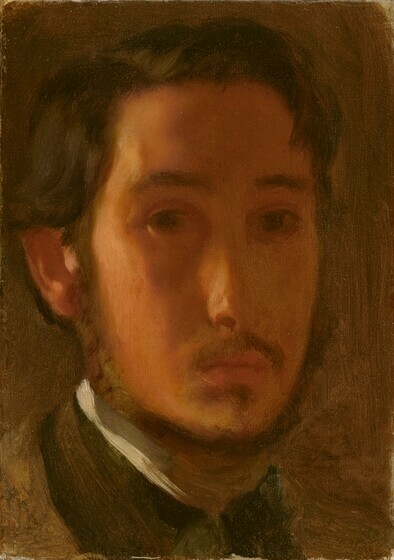 Degas himself suffered poor eyesight, and had already lost some vision by the time he was in his thirties. Perhaps for this reason, his portrait of Estelle seems particularly sympathetic. Her unfocused gaze appears almost contemplative. 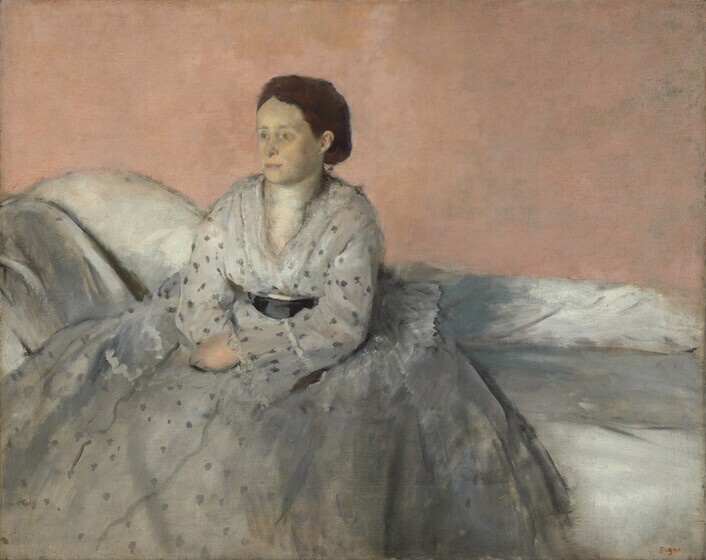 The diffuse light around her obscures detail, and Degas' restricted range of tones -- dove grays, dull pinks, and off-whites -- gives the sensation of vision that is soft but indistinct. 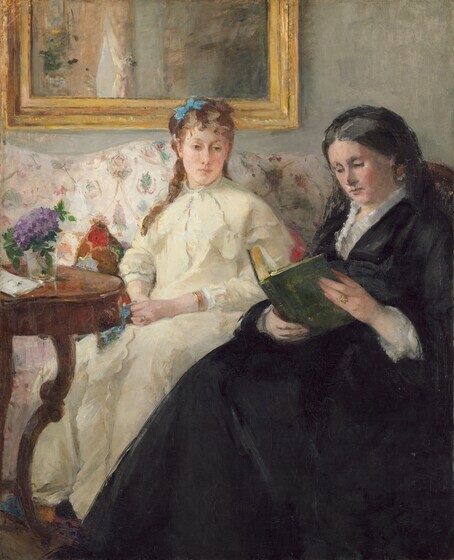 Degas unleashed his biting wit on many of his colleagues, but was impressed with the work of American artist Mary Cassatt, saying of her "there is someone who senses painting as I do." Like him she maintained the importance of drawing and carefully planned composition. In 1877 Degas invited her to exhibit with the impressionists. Probably it is Cassatt we see here. Degas made a number of prints and pastels of Cassatt and her sister during visits to the Louvre -- where, in fact, she and Degas first met. These works make it possible to identify the setting of this work. Although painted freely, Degas' sketchy brushstrokes convey the surfaces of painted canvases in heavy gold frames and the pink columns still found in the Grande Galerie. The line of Mary Cassatt's silhouette and the tilt of her head are lively and energetic, but her expression is withheld from view. Women at work provided inspiration for Degas. In addition to ballet dancers and cabaret singers, he also painted milliners and dressmakers, laundresses and ironers—such as the young woman here. Writer Edmond de Goncourt described a visit to Degas' studio when the artist showed him "washerwomen and still more washerwomen...." Degas was interested in their movements and postures, the patterns and rhythms of their work. 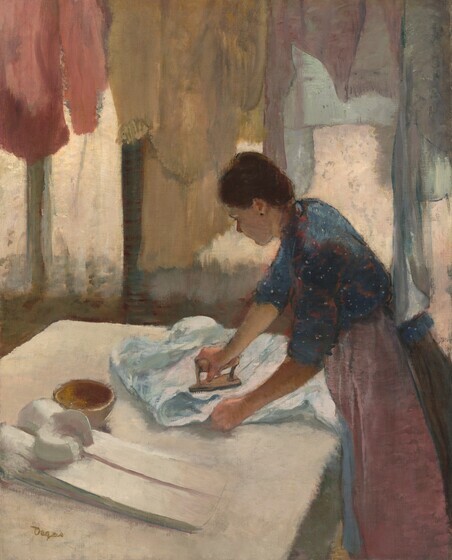 Degas, de Goncourt continued, had gone about "speaking their language, explaining to us technically the downward pressing and circular strokes of the iron, etc...."
Laundresses also appeared as characters in newly popular realistic novels, which detailed the difficult lives of these women. They worked long, hot hours for low wages, and because they wore loose clothing and made deliveries to men's apartments, their morals were often questioned. Degas, however, seems not to have been interested in their social situation so much as in their characteristic gestures—in the line of his ironer's body as she leans into her work, in the soft curtain of color provided by the garments that hang around her, in the crisp shirt folded on the table. Degas frequented the ballet and opera, where he found subjects not only in performance but also within the unexpected frames created by the angles of stage wings and practice-room mirrors. He never accepted the label "impressionist," and his momentary, snapshot-like views result -- not from spontaneous improvisation -- but from deliberate arrangement. An avid photographer, his compositions were often influenced by that new medium. Here, for example, the figures are clustered to the left, some cut off at the picture edge. We cannot even be certain that it is four dancers we see -- perhaps, instead, this is a single figure, moving as in the sequential photographs of running horses and men by Eadweard Muybridge. 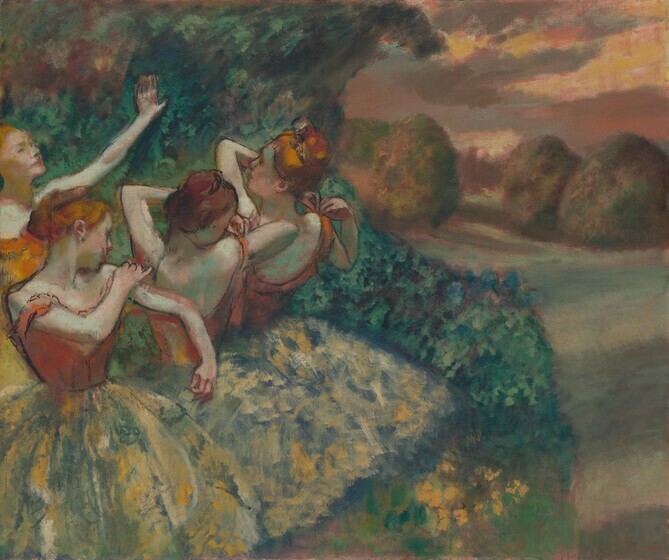 The sketchy background of the stage set, painted in a broad, almost blurry manner, is typical of Degas' late works, but he trains a sudden sharp focus on the dancers' backs. 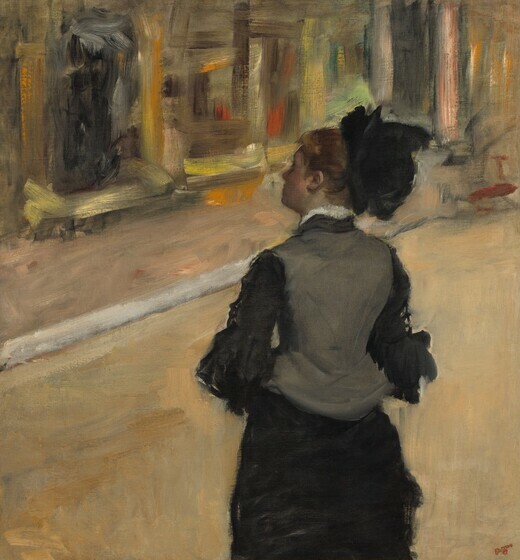 Our eye follows the linked movements of their arms, as Degas described in a sonnet: "The ribbon of her steps twists and knots...."
Berthe Morisot told her mother that she would "rather be at the bottom of the sea" than for this picture to appear at the Salon. Her reluctance stemmed from the "assistance" of her friend and future brother-in-law Edouard Manet, leader of the avant-garde, whose advice she had solicited. Calling at her home, Manet took up a brush, and as Morisot described in a letter: "...it isn't possible to stop him; he passes from the petticoat to the bodice, from the bodice to the head, from the head to the background." In the mother's face and dark costume Manet's strong, broad brushstrokes are discernible. For both artists, however, the appearance of paint on the canvas, more than the illusion of reality, is of greatest interest. This picture, after having been accepted at the Salon, was probably seen again in the first impressionist exhibition in 1874. Unlike Manet, Morisot embraced the outdoor painting and spontaneity of impressionism, participating in all but one of the eight impressionist exhibitions. As a businessman and politician, collector and critic, Duret married an active public life with an interest in the arts. As a young man, he had been an intimate of the avant-garde circle of Manet and Degas. In the background of Vuillard's portrait we see a literal reflection of that youth -- glimpsed in a mirror is another portrait of Duret, painted many decades before by the American James McNeill Whistler. Vuillard uses the Whistler portrait to contrast the old man with his younger, more vigorous self. 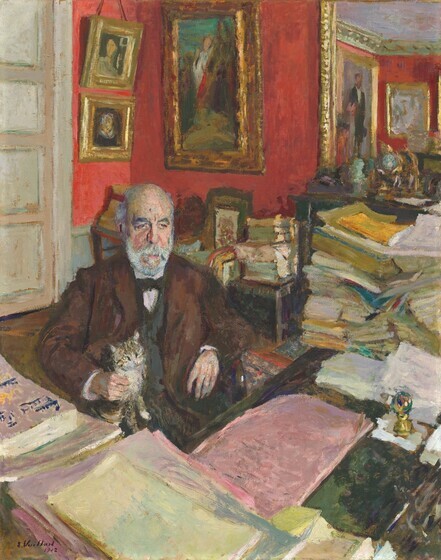 The elegant younger figure stands erect; the old one is seated amid the papers that indicate his long career as a writer and critic. He is frail at seventy-four, almost a ghost of the young man whose political passions nearly sent him to the guillotine. His companion now is the cat Lulu, no longer the youthful men who challenged -- and changed -- art and literature. Vuillard's dramatically tilted view into Duret's study recalls the unexpected angles of Degas' work, though for Vuillard, born a generation later, the influence of other artists, especially Gauguin, was more important.